"Many Republicans say immigration policy divides their party. If, however, the party becomes a gaggle of veto groups enforcing unanimities, it will become what completely harmonious parties are: small. Many Republicans rightly say that control of borders is an essential ingredient of national sovereignty. But net immigration from Mexico has recently been approximately zero. Border Patrol spending, which quadrupled in the 1990s, tripled in the 2000s. With illegal entries near a 40-year low, and a 2012 Government Accountability Office assessment that border security was then 84 percent effective, will a “border surge” of $30 billion more for the further militarization (actually, the East Germanization) of the 1,969 miles assuage remaining worries? Many Republicans say immigration runs counter to U.S. social policies aiming to reduce the number of people with low levels of skill and education, and must further depress the wages of Americans at the bottom of the economic ladder, who are already paying the price for today’s economic anemia. This is true. But so is this: The Congressional Budget Office says an initial slight reduction of low wages (0.1 percent in a decade) will be followed by increased economic growth partly attributable to immigrants. Immigration is the entrepreneurial act of taking the risk of uprooting oneself and plunging into uncertainty. Small wonder, then, that immigrants are about 20 percent of owners of small businesses, and that more than 40 percent of Fortune 500 companies were founded by immigrants or their children." Compelling. The only GOP argument against passing some form of comprehensive immigration reform that holds any water whatsoever is the partisan political consideration that it might bring more Democratic voters into the next few election cycles. I find that argument potentially accurate, but morally bankrupt. It's on a par with Barack Obama unilaterally issuing executive orders delaying employer mandate deadlines codified in law and designed to pay for Obamacare until after the next two election cycles. There is no doubt the Obama administration took these actions for the singular partisan political consideration of hoping to improve the Democrats prospects of keeping the majority in the Senate in 2014 and control of the executive branch in 2016. It stinks. So does the Republican position delaying immigration reform on the basis of partisan politics. Will's column is his considered response after getting blindsided by Laura Ingraham in a segment on Fox last Sunday. They were reported "at loggerheads" over immigration and Ingraham either "lost it" or "KO'd George Will" or something. Unsurprisingly, Ingraham's economic populism strikes a chord with some, and got most of the media attention. "Why have borders at all? Why have a border?" she asks Will. She dismisses Juan Williams for making an argument about deporting grandmothers and kids saying "The emotional argument! ... Facts don’t matter! Constitution! rule of law! Let’s just do legislation by emotion!” Her emotional argument came shortly after she pilloried Will with another... um... gratuitous emotional argument: "Do you care about American workers at all and their jobs and their wages, and their dream?" Keep in mind that Ingraham is a talk radio host and was in her element. George Will is first and foremost a writer and columnist. He is in his element with the written word. His column may not stir the emotions, but it clearly trumps Ingraham's rant. One particular point he made in both the "debate" and in his column resonated with me: "...to emigrate is to make an entrepreneurial act, to uproot yourself and perhaps your family and take a risk. And those are the kind of people I want more of." Exactly. Since Will has the rational, logical argument covered, permit me to indulge in an emotional argument of my own. That is my grandmother and grandfather pictured at the top of the post. 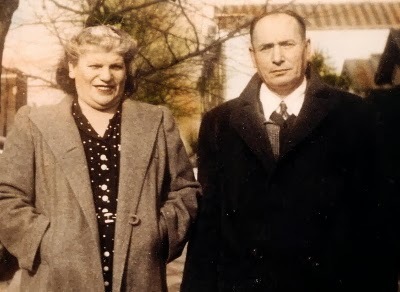 They both immigrated to the U.S. from what is today Ukraine (then part of Russia) to escape persecution and in search of a better life. Grandpa landed in Philadelphia at age 19 in 1906, entered the country legally, made his way to Chicago, and eventually became an American citizen. Grandma landed in Canada with her mother and they somehow found their way to Chicago. We're not sure she crossed the U.S. border legally. Probably not. They met, married, built a life and raised a family. As a consequence, a couple of generations later, I am sitting here in San Francisco typing their story into a blog post in defense of immigration reform. Here's the point. I deeply admire the people who risked everything to get into this country just to have a chance to work hard and build a better life for themselves and their family. And it does not matter to me whether we are talking about the beginning of the 20th or 21st century. If they are here, productive, have built a life and support a family, I don't really care if they came in legally or illegally. They deserve this country. That does not mean I don't support a secure border. I do. It's important. That does not mean I do not support immigration controls and enforcement. I do. It's important. But as George Will points out, the border is a lot more secure than it's been anytime in the lifetime of anyone reading this post. By far. Perhaps more secure than anytime in the history of the United States. I doubt that throwing another $30 billion at the problem to ratchet up border security efficacy a few percentage points from 84% to 89% or whatever makes a lot of sense, but if it helps Republicans and Democrats feel better about passing immigration reform - fine. This might strike some as nostalgia, but ultimately America is not about geography limited by borders. America is about an idea and ideals. I can't shake the sense that people who risk their lives to come here, to escape desperate circumstances in the country they were born, to work hard and build a better life for themselves and their families, are people who deserve this country more than many who were born here. If they are already here, if they can show they are working and contributing to our country, then they should have an opportunity to continue to contribute and an opportunity to make this country their country. It's the right thing to do. It's time. We want them here. They make us stronger. Latinos have been very loyal Democratic Party voters for over 50 years. The idea that the Republicans can appeal to them in the future is naive and laughable. Does anyone really believe that a demographic group that is poor, remains poor generations after immigrating to the U.S., and where more than 50% of the children are born to single mothers will ever vote for the more conservative party. Living in a neighborhood where one does not live next to poor people is becoming more expensive. Open borders, amnesty, and increased legal immigration just increase the cost of living in the good neighborhoods with the good schools. Why do not many people want to lower the living standards of American citizens so that so many third world immigrants can try to reestablish their home countries inside the U.S.?